Alert Protective Services is Chicago’s premier, locally owned and operated source for business alarm systems and home monitoring equipment. They have been providing outstanding service and support to thousands of Chicago-area homes and businesses alike. Alert Protective Services is solely Chicago based. All of their owners and technicians live within the area, so our customers don’t have to worry about out-of-town-management or monitoring. This is a great relief to customers who are displeased with a national security provider’s service. APS makes it a point to always be there whenever you need them. They provide your family or business with the highest level of protection possible. Being family owned Alert Protective Services always protects your family with the same high level of protection that they use within their own homes. Given the close proximity to the corporate headquarters, residents of Morton Grove will receive the most prompt service and support APS has to offer. APS also provide unparalleled 24 hour-a-day support on all their equipment. Morton Grove resides north of Chicago in Cook County. The village has a population of 22,451 residents and 8,199 different households. The median household income in Morton Grove is $63,511. In 1981, Morton Grove became the first village in America to prohibit the possession of handguns. This law stood strong until 2008, where it was dropped due to pressures from the Supreme Court’s opinion. Morton Grove was also noted by Family Circle as one of the nation’s “10 Best Towns for Families”. 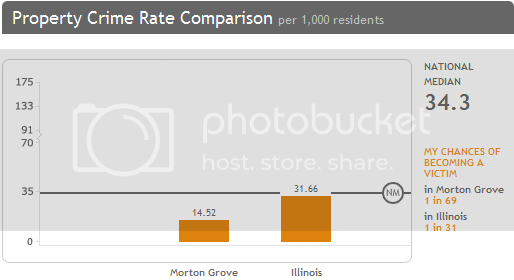 Although Morton Grove may seem like the nicest place in the country, it does have its fair share of crime and the number of burglaries has been rising in the recent years. Last year, there was an average of 67 crimes committed per square mile in Morton Grove. Compared to the national average of 49.6, you can see that crime does exist. In 2009, there were a total of 343 crimes reported in Morton Grove. Most of which, 326, were property thefts or burglaries. Only 17 were violent crimes. Specifically, you stand a 1 in 1332 chance of being a victim of a violent crime and a 1 in 69 chance of a theft or burglary happening to you. Burglaries and especially thefts occur far more frequently than violent crimes and they affect a greater number of residents. Residents should have a professional from APS come out and diagnose your home’s specific security needs. All residents of Morton Grove should have a home security system in place and most homeowner insurance policies offer discounts for those who do have one. Recently, the FBI conducted a study a found that if you have a home security system in your home, you are 15 times less likely to be burglarized. A security system is the most important line of defense against thefts and burglaries in your home and in your place of business. APS is fully capable of protecting your home and your business from unwanted threats. We build one-of-a-kind monitoring systems to ensure the safety of your family and your employees. APS always takes into account your specific needs and budget and crafts a system to fit your desires. We offer many different customizable products and services. Contact APS today so we can start building the best security system available for you.